We have been providing great chiropractor adjustments Cary NC, acupuncture, and medical massage therapy to Cary, NC for well over 11 years. Our time-tested and practiced chiropractic and acupuncture therapy is safe for all ages. This makes this the family chiropractic office of choice. Annoying back pain, auto accident injuries, and improper nutrition is resolved at Preston Chiropractic & Acupuncture. Our Chiropractors and Acupuncturists are friendly, family-oriented, and very qualified. With your complete health in mind, we strive to excel in your unique chiropractic and acupuncture needs. Quality is key when receiving any service. Our staff here at Preston Chiropractic is friendly, personable, and cares about your well being. Whether traveling from right here in Cary NC, Morrisville, Apex, Holly Springs, Raleigh, or even Durham, our clients can speak for themselves with excellent testimony about our therapy to the whole of the Triangle. Our Chiropractors are fully licensed with respectable credentials including education from the prestigious Sherman College of Chiropractic. 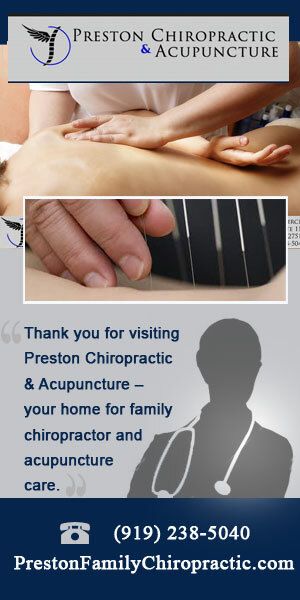 You will be in great hands at Preston Chiropractic. Feel free to click on one of the Doctors below to find out more about who you may be receiving care from.